HCM CITY — Enterprises increasingly appreciate the importance of human resource management and have mapped out human resource development strategies methodically, a seminar heard in HCM City yesterday. Nishant Mahajan, frontier market leader and head of executive remuneration at Mercer Singapore, said export manufacturing continued to be main driver of Việt Nam’s economy but the weakening đồng and limited labour skills were among the challenges faced by companies. According to the Talentnet-Mercer Market Pulse Report released recently, the top reasons for employees quitting an organisation are lack of a clear career path and low pay competitiveness -- 47 per cent of respondents each -- whereas low pay competiveness had been secondary to a career path in past years. Nguyễn Thị Thanh Hương, deputy CEO of Talentnet and head of human capital solutions and Mercer salary survey department, said: “In the digital age where businesses are predominantly occupied by millennials, behaviours and expectations of employees are rapidly diversifying. HR leaders from Saint Gobain, Schneider Electric and Nestlé also shared their experience at their companies. According to Nguyễn Hà Trang, HR director at Saint Gobain, said using remuneration data is very important to improve salaries and know how competitive their salaries are compared to the market. 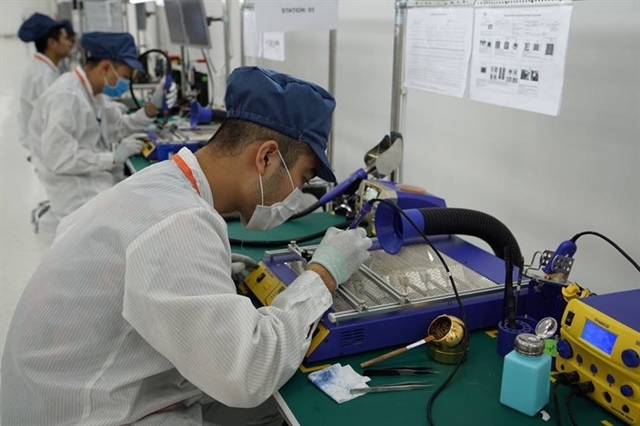 Lê Thị Khải Minh, head of the salary and benefit division at Nestlé, said previously compensation and benefit were confidential, but in the Industry 4.0 era employees can easily find out the compensation and benefits that other companies pay for similar positions. "Therefore, Nestlé communicates clearly and transparently the compensation and benefits that employees would get and their career path and the way the company evaluates employees at each level," she said.